In stock 17 pcs. Also available in our walk-in store. 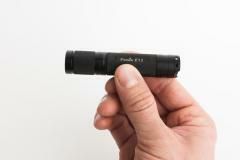 A really great all-round pocket sized mini flashlight from Fenix. Excellent value, cheap yet very realiable and functional for just about any use. No unnecessary complicated features, just three light modes and that's it. 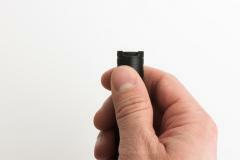 And the best thing of all: uses a single AA battery! 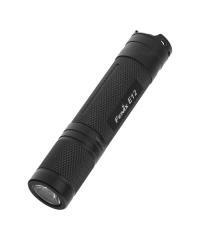 Thanks to its small size and readily available battery type, the E12 is suitable for casual use, EDC and outdoor people. The product has a 5-year warranty against factory defects. Fenix is a quite recent name on the flashlight market. The "thing" about Fenix is their excellent value, very affordable yet very high quality. 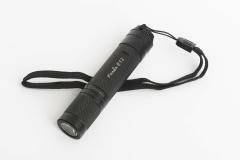 Fenix is a great choice for anybody looking for a real workhorse flashlight! Kovaa käyttöä kestävä laadukas pikkulamppu, yllättävän kirkas maksimitehollaan.